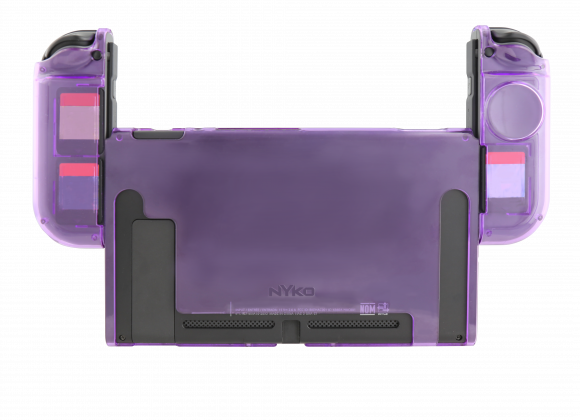 Accessory maker Nyko has revealed a brand new Switch case design which will protect your beloved system and offer a traditional D-pad solution all in one. 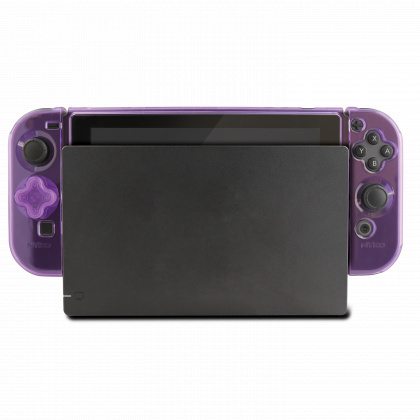 The 'Dpad Case' was first revealed at CES 2019 last week, offering an ultra-thin protective solution for your console. 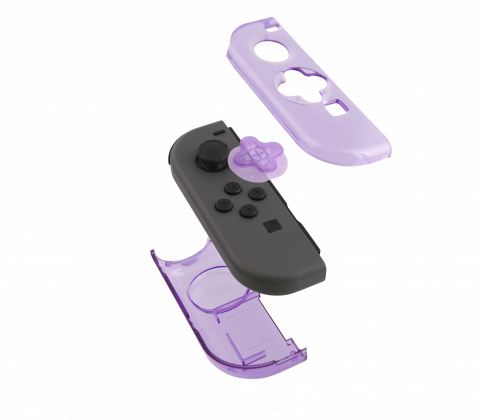 As well as protecting the main unit, a removable cover for the left Joy-Con's buttons allows owners to switch between using the standard controller buttons or a makeshift D-Pad design. On top of that, the Joy-Con cases actually double up as little game storage solutions, meaning you can carry three games with you at all times without the need for an additional case or storage wallet. The thin design also allows the console to be docked, so you shouldn't ever have to remove the case if you're happy with how it feels. An exact release date for the product hasn't been shared just yet, but we do know that it's expected to launch in spring 2019. It'll be available for a recommended retail price of $19.99. Does this look like a useful accessory for you? Do you think you might treat yourself to one when it launches? Let us know down below in the comments. This legitimatly looks helpful! Does anyone know how hood the d-pad is? I rarely use it but I can see it being useful. Its a bit pricy, but I love that purple color! Edit: what is that wierd circle thing on the side for? That looks like it'll mess with me quite a bit. Does taht store the d-pad or something? Interesting place to store games. Now that is interesting, shame its not a circle D-pad like the Megadrive, but I love the colour of it. 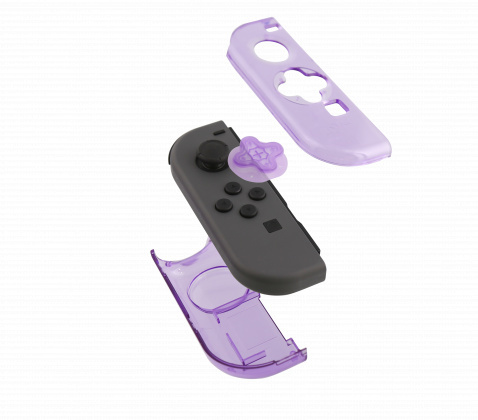 Nintendo, please make a see through Switch like the old Purple see through Gameboy colour which I love so much, and the purple see through N64 controller I destroyed by using it too much. @MysticGengar Yeah, the source article says that circle indention is for storing the Dpad. I agree, this does look a bit nifty. I'll be waiting to hear how it feels. And I'm gonna need some different colors. Yeah I like this and cheap enough to just give it a go TBH. Anyone with different joy con colour option than grey will not be 100% happy putting this cover on. I spent almost 100 quid on Super Mario Red variant and this accessory, which is cool btw, is a no-go for me. @MysticGengar It's very hood indeed. It was raised on the streets and walks down dark alleys without fear. this is pretty neat as the case i brought can't be docked with it installed so i hardly use it, this gets past that, any news of this coming to the uk? i might pick this up. Won't be a proper solution but at least it's something. Still gonna try it. Looks pretty neat. Not sure about the color, and that D-pad looks questionable, but I like the idea. 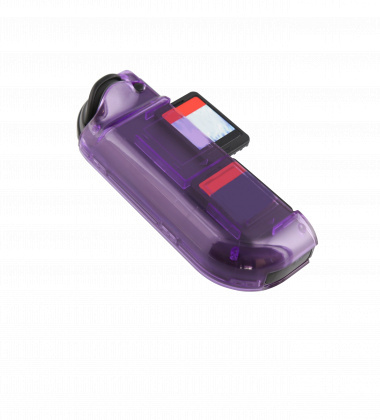 @Dualmask I had the purple see-thru gameboy so i quite like the color. Looks very convenient for me, since I play a lot in handheld mode. Thanks! I had a hunch. Good to know. Gotta pull off the edgy look nowadays to stay hip. @Gravitron I normally like purple but for some reason that particular hue is rubbing me the wrong way. Options are always nice anyway...I wouldn't mind if it were red or even clear. I don't really get the obsession with having a 'proper d-pad'. I was a little concerned about the Joy-Con's buttons prior to launch but after spending some time with the system it was a complete non-issue. I'd go as far as saying they're probably better than a d-pad in most situations. I mite get this for my young nephew. He treats his stuff like a little destructive kid would. he 'lost' the micro sd card the other day. he thought it was a game, tried to put it into the game slot and it fell out 'somewhere'. Wondering how the very little extra weight of the protection affects(effects? help) the built in stand. I can envision the d pad being or feeling not so great. The problem with any of these solutions is that it doesn't create a genuine d-pad. A proper d-pad rocks and you can't depress left and right or up and down together while you can on Switch. Having said a this, despite still not being able to play fighters with it every other thing I use the joy-con d-pad for I have pretty much found I have no issue with. 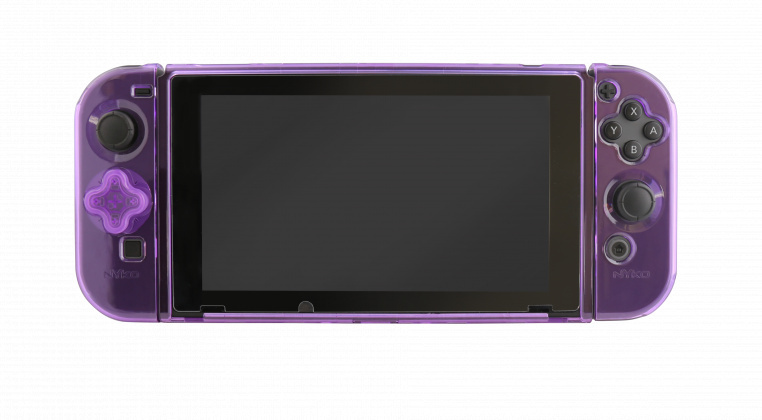 @Bunkerneath You can buy a see-through purple case online and mod the Switch yourself, if you're so inclined. My friend installed one on his, and it's BEAUTIFUL. I'm very tempted myself. Just waiting for the warranty to expire. I knew someone would have the sense to make a case like this eventually. D-Pad? Now your speakin my language! I'll just stick to my 3rd party d-pad shell. Plus, a case probably ruins the HD rumble. @AlexOlney Lol Its got street cred! All depends on if the dpad is actually any good, if it is, i'm interested. Hoping for more colours though because that one is nasty. I wouldn't wrap a case on my Switch for fear of heating issues while docked. BUT, if the left Joycon gives a proper D-pad feel, I'll get this just to have the Joycon cases. @Gravitron how did you manage to overheat the switch? Looks pretty cool. 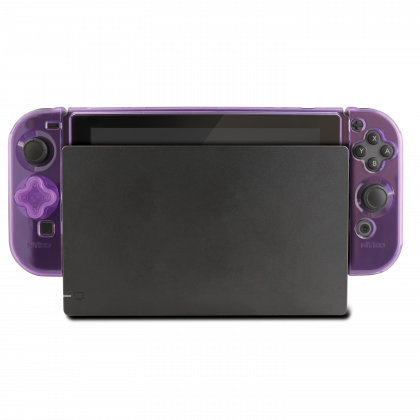 My only fear is the material appears to be the type that's flexible and stretchy.....I'm curious how well the dpad holds up in that stretchy frame, or if it shifts around. “Proper “D-pad? Not even close. The Hori D-pad is a way better option. @JamesJose7 I've had mine since Odyssey came out and I rarely took it out of the house probably 4 times ever. Was very gentle with it, but like a month after my warranty ran out it started shutting down automatically and giving me an error message that said system is overheating. The fan sounded like a motorcycle and the system wouldn't run for longer than like 20 minutes so I finally called to schedule a repair. They generously extended my warranty even though it had run its course (pays to be calm and friendly) . Anyways the only thing I can possibly blame is how the dock blocks the back left vent (before someone tries to correct me they are vents not speakers) and could possibly lead to uneven heat distribution. My solution going forward was to get a dock extender ($12) and put the console in a 3d printed kickstand ($3) while I play docked. It hasn't given me issues since. Seems kinda stupid to be honest. I bet that makes it easier for it to overheat and it makes it thicker/bulkier. Also you can't dock it with that on the console at least. No thanks, I'll just stick with a travel case. This actually has my attention and is pretty novel. I'm usually not a fan of that color shade either, but it's working for me, for some reason. The storing of the game cards is a nice touch. Ok Nyko, I see you! @JayJ the article clearly says that you can use the case while it's docked and it even shows pictures, why do you think it doesn't? @MysticGengar I like the Hori D-Pad joycon I got. I picked it up during Black Friday for $16, so cheaper than the price of this skin. Of course, it doesn’t include any rumble, whereas this skin would allow you to have rumble still. Oooh, I like the look of this. I don’t play much in docked mode, but it’s nice to know I wouldn’t have to take the cover off every time I did. I hope it comes in multiple colours, though. Would love a clear one so I can still see the skins I put on my Switch and joy-cons. @Flowerlark This color reminds me of the Grape Funtastic N64. Forget which game came with the purple one. I know DK was Green and think Pokemon was Red. Maybe Perfect Dark. I dont want to hate on anyone who likes this because thats cool you know if you like it and im glad its there for those who want it but i really really hate this. Its very rare i have such a negative reaction on something but i honestly hate everything about this. Hate it. Every time i look at it i hate even more than the last time. @bluemage1989 I can't tell if I hate it or love it myself. lol I might wait and see, because a new D-Pad solution always sounds nice. Yes!!! I will be scooping this up day one!!! @huyi That looked like promotional material, you never know how legitimate that is as a lot of it is just highly edited and they create fake images for promoting products all the time. I would wait and see how it actually tuns out and I would make sure this isn't going to brick any consoles. @JayJ you are right about that, the stock images are always made to look good, maybe some reviews will turn up for the case so i will have a look out. @Gravitron i've never had overheating issues with my switch but maybe this will become a issue with this case this is why i want a review before i buy. 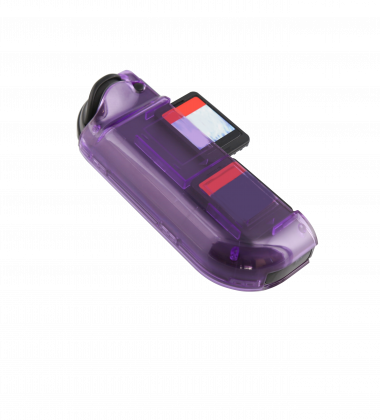 @bluemage1989 i like the colour too, i have a n64 in the same colour also used to also have the clear purple gameboy color too. @NIN10DOXD i play mostly docked so this really isnt made for me anyway but it just looks so cheap and tacky to me. I dont doubt it works okay in terms of protection but i could never, in all good conscience, put this on my Switch lols hope the d pad alternative helps out those who are struggling though. @MysticGengar excuse me, pricey? Is that supposed to be a joke? It’s 20 dollars for christ sake.. 20 dollars for a case.. That’s cheap. Lol, the games might get crushed while playing.